A log cabin can be made from virtually any group of tall trees. However, a log cabin that lasts must be made from a narrow selection of wood types that have the characteristics needed to craft a sound, visually appealing structure that will retain its strength, value and appearance for decades and beyond. The following describes the common and not-so-common types of logs used in log cabin construction. The fact is that the logs used in construction of your log cabin by a local company will offer as its most cost-effective option logs drawn from regional sources. Ordering and transporting logs from great distances is expensive. Most consumers will rightly flinch at the cost when locally sourced timber can provide the right quality logs at an affordable price. 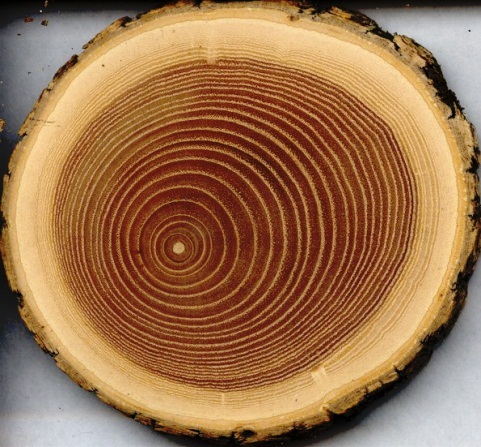 The wood from these trees found in the lower Southeastern portion of the country have a fairly solid reputation for resistance to rot and infestation. However, this resistance is pegged to its deep interior or “heartwood” of the tree. 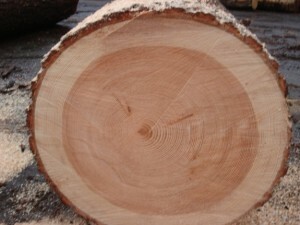 A tree’s heartwood is usually visually distinct from its outer sapwood, which is typically lighter. 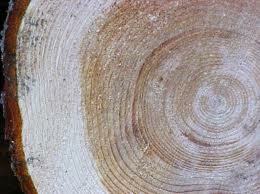 The sapwood of Cypress is very light and nearly white. Its heartwood ranges from light yellowish brown to dark brown or reddish brown. 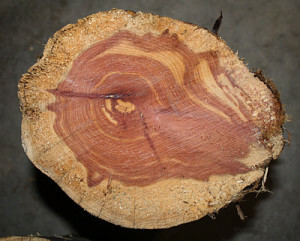 A Cypress log for use in a log cabin may not be milled sufficiently to expose the heartwood. 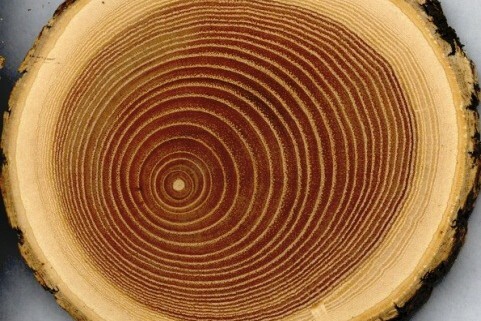 Therefore its self-preserving properties remain trapped in the log itself. When this happens a customer has paid more than 2 times more for the log but their log cabin does not have the protection that they hoped to buy. 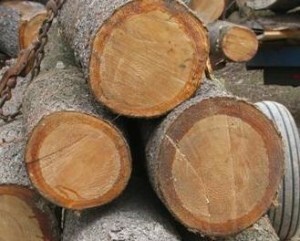 Cypress logs offer strength and durability. The prohibitive drawback of Cypress is cost – and availability. A Cypress log cabin can cost as much as 2 times the cost of a Pine log cabin. And, it is so difficult to gather in sufficient quantity, a builder often has to compromise on which logs must be used. For most prospective buyers, the sticker shock of a log cabin constructed from Cypress logs is enough to send them shopping for a cost-effective alternative. The Douglas Fir is perhaps best known as a Christmas tree in cabins across America. Full- grown stands of Douglas Fir provide provides strong and durable lumber for construction purposes, including plywood and high grade veneer, interior trim, cabinets, pallets, boxes, ladders and flooring. It is also a good and plentiful tree for log cabins. The tree is plentiful and moderately priced when locally acquired, i.e. the Rocky Mountains and the Pacific Northwest up into Alaska. As seen here, the sapwood is white to pale yellow. The heartwood is orange-red with a definitive contrast between earlywood and latewood. Overall the wood is straight grained and moderately hard. It is a good building material but delivery costs to the Eastern states are prohibitive for most customers. White Pine is an eastern tree that is also sometimes decorated outdoors as a Christmas tree. As one of the fastest growing northern forest conifers, it is frequently used in reforestation projects and remains one of the most widely planted trees in North America. Eastern white pine is found across southern Canada from Newfoundland south to southeastern Minnesota and northeastern Iowa; east to northern Illinois, Ohio, Pennsylvania, and New Jersey; and south mostly in the Appalachian Mountains to northern Georgia and northwestern South Carolina. It is also found in western Kentucky, western Tennessee, and Delaware. Its color is very light, shading from white to a pale yellow color. It darkens toward a tan color within a few months of installation. As a construction log, White Pine holds its shape well and can be effectively milled. It also is easily stained. Mature trees typically have no branches on the lower half of the trunk, meaning few or no knots. “White pine wood has medium strength, is easily worked, and stains and finishes well,” accords to the U.S. Forest Service. Green River Cabins exclusively uses white pine logs in constructing the exterior portions and main interior beams in our log cabins. The logs we use are acquired exclusively from Ellis Lumber Company and Logs in Shelby, North Carolina, which acquires and mills its logs for us to the optimal 4’’x12” commercial size (actual size is 3.5”x11”). Before the logs are cut and delivered to Green River Cabins, Ellis inspects each log for quality upon arrival and again before departure. The logs arrive at Ellis green, meaning recently cut, usually from a growing area within 200 miles of the plant site. The logs are then air-dried on the yard for 90 days. Next they move to a kiln for a two-week drying that reduces the moisture content of each log to an equilibrium moisture content (EMC) of 19 percent. This process is critical in achieving a stable, usable log. Green logs should never be used in the construction of log cabins–or virtually any other commercial product for that matter. 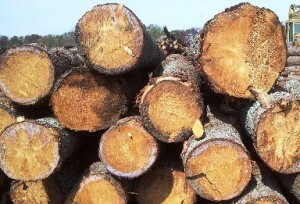 The moisture content of logs must be reduced to increase log strength and prevent future twisting, warping and shrinkage that otherwise would inevitably occur. 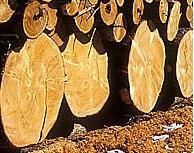 A properly dried log is also less susceptible to biological deterioration from fungi and insects. 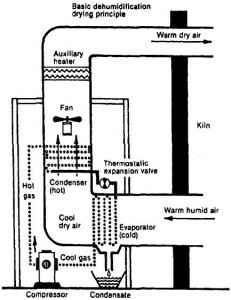 Schematic of a dry kiln. 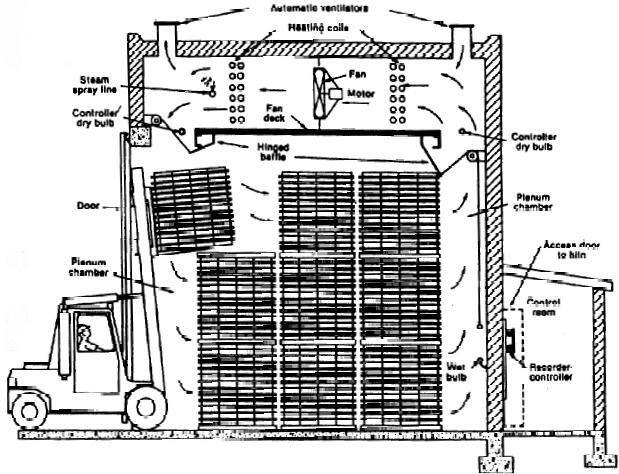 (USDA Dry Kiln Operator’s Manual. Dehumidification drying system. 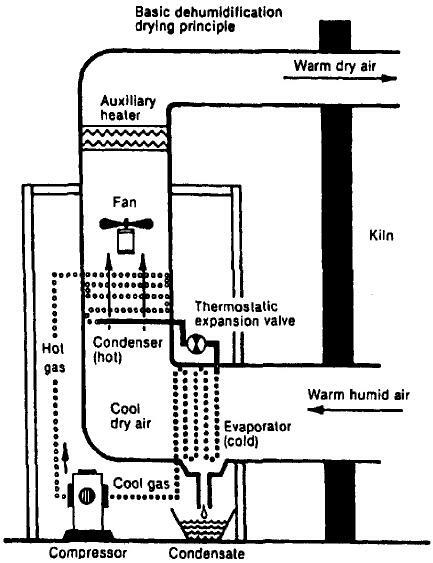 (USDA Dry Kiln Operator’s Manual. NELMA’s Eastern White Pine grade rules define the limiting characteristics (knots, holes, splits, etc.) allowed in each grade (quality level). While the rules describe the poorest piece permitted within a grade, it is unlikely the maximum size or number of these characteristics would be present in any board. D & Better Select is a combination of the top two Eastern White Pine grades, C Select and D Select. Material of this high-quality grade combination is used for natural or stained finish applications, fine woodworking, or interior trim. Although the reverse face of D Select shall permit sound characteristics typical of Standard grade material, C Select shall only permit the characteristics of D Select on the back. D Select, which is the lower of the two grades, allows pin knots (maximum size is approximately 1⁄2”) and limits the total number of pin knots to one knot per surface foot. Checks and shake are barely perceptible. The occasional pocket is very small. A split will not exceed 1⁄2 the width. Pitch, when present, is evident, but limited by surface area of the piece. Medium stain (blue or coffee) cannot exceed 3⁄4 of the face surface area in a clear board, and less if present with other limiting characteristics. A larger surface area is allowable if the stain is light. Skip is permissible on the back face or one edge of 20% of the pieces. Wane is limited to the back face. 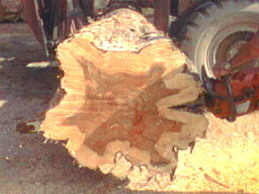 Occasional pieces may require a cut to yield all useable lumber for finish work (loss not to exceed approximately 5%). Characteristics in C Select are no larger and less numerous than those same characteristics in D Select. 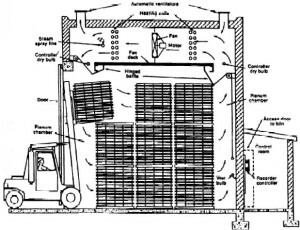 The “Standard NELMA Grading Rules for Northeastern Lumber” shows all allowable grade characteristics, which is posted at: www.nelma.org. After being properly inspected and approved, the logs are shipped to Green River Cabins, where they are further expertly custom cut to size and cut again to form our signature dovetail corner. Yellow Pine is also decay resistant. As its name suggests, it is darker and has a distinctive yellow hue. It is less accepting of stains. Yellow pine is relatively inexpensive. An evergreen that is a heavy hardwood that provides good strength and shape rigidity. Cost is a factor for shipping outside its habitat in the American west. Strong, durable and typically cost prohibitive. Widely known as the fragrant wood used in chests and closets to prevent moth infestation, Red Cedar has a trademark pink-to-brownish-red hue. It is light but durable, especially in wet climates. It is moderately expensive. A moderately strong hardwood resistant to rot and insects. White cedar is a great wood for porch railings and posts. If one were to use a wood other than cedar in the lower rail of a deck rail shown in the photo below, it is unlikely to last more than a year before it rots.